I have had a few meetings so far with the ADPi chapter for which I am an adviser (look it up) and I must say, I am really enjoying it! The girls are really sweet and don't make me feel too old or out of touch with reality, much like we probably did our advisers. I am enjoying learning all the new lingo and traditions that are unique to Vanderbilt as well as all the stuff ADPi chapters are supposed to do now. They were talking about homecoming at my most recent meeting and another adviser and I realized they don't even do floats at Vandy. They are supposed to decorate golf carts for a parade, but even that is optional. I can't imagine homecoming without a float! Speaking of traditions, Hey Day was yesterday. Does that make you nostalgic or what? A day set aside JUST to say Hey! to everyone you encounter. I love Auburn. 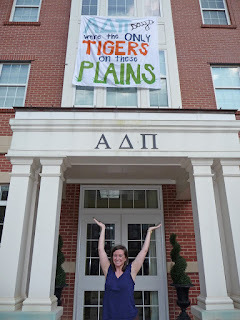 I know loads of Beta Omegas read this blog: what do you miss about ADPi and/or Berta Dunn? If it's a good tradition, I'll try to convince the girls they need to start doing it. I will tell you what I don't miss, and that is Miss Eunice taking out the "tursh" and then napping in our study rooms! I miss he halls of Berta and spying on people as they said goodnight to dates from the copy room. And I am pretty sure most RAs were terrible! I love that we posted about trsh at the same time and didnt mean to! Heath's new boss' wife is an ADPi fanatic here in Birmingham. She asked Heath why I wasn't more involved. I thought about being an advisor, but then remembered I have some little monkeys running around that need much more advising! Jealous of you, though - that sounds fun! I definitely miss our terrific RAs, who blamed me for firing Eunice, which I did not do. (I even ran into her later and made sure my name was clear). I miss the TRSH notes, the Bachelor in the Hand twins' room, and always having someone to hang out with, even in the middle of the night! 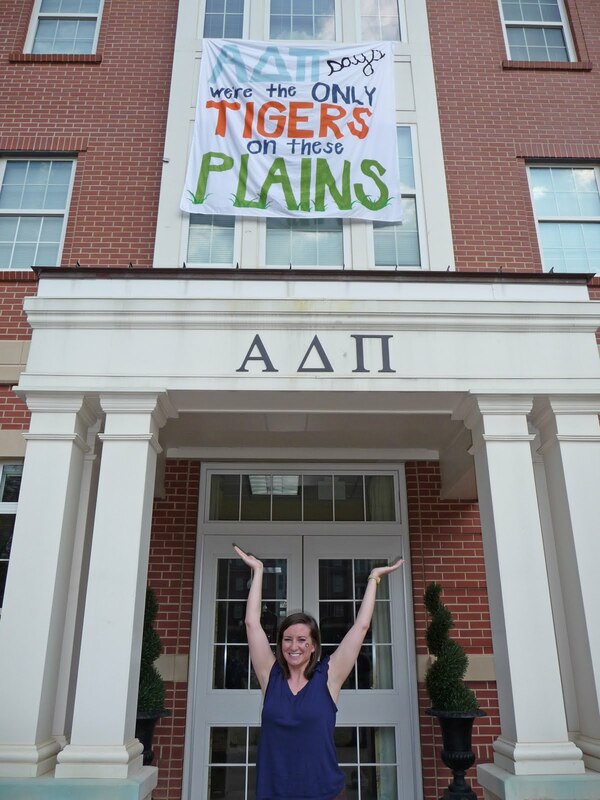 As a sister of Alpha Gam, I don't know much about ADPi things, but I DO appreciate the good AGD/ADPi football rivalry..some of the best times were had on the intramural field ripping off each other's flags!! I miss staying up late playing Mafia in the chapter room. Oh wait.. I'm not an ADPi. But that still happened.